Mr. Guy H. Mallory age 101 of Elkton, KY passed away Friday June 1, 2018 8:40 p.m. of natural causes at his residence. Services will be Monday June 4,2018 2:00 p.m. at Latham Funeral Home in Elkton, KY with Rev. Mark Keith officiating. Burial will follow in the Glenwood Cemetery in Elkton, KY with full military honors. Visitation will be Monday from 12:00 noon till the funeral hour at 2:00 p.m at Latham Funeral Home in Elkton. Mr. Mallory was born in Todd County March 3, 1917. He was a retired U.S. Air Force Officer with over 20 years services having served in World War II and the Korean War. He was also retired from the United States Postal Service. 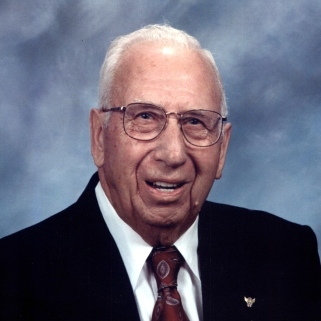 Mr. Mallory was a member of Elkton Baptist Church, The Retired Officer’s Association, American Legion Post 91 in Elkton, KY, The Aviation Museum of Kentucky and the Elkton-Todd County Airport Board. His wife of 58 years Ima Gene Cook Mallory passed away in 1998, also preceded by his parents Judge James Randolph Mallory and Bonnyebel McKinney Mallory, his brother Robert Reynolds Mallory was killed in action in World War II, other siblings who preceded are James R. Mallory Jr.and Alva McKinney Mallory, sister Nelle Mallory Smith. Mr. Mallory was very instrumental in the Senior Citizens Building having donated the land it is built on. Also, he had donated land to the Library Board to be used for a new building in the future. Mr. Mallory is survived by several nieces and nephews and many friends. In lieu of flowers the family ask donations be made to the future building of the library.Make checks payable to Todd County Public Library 302 East Main St. Elkton, KY 42220.